My math materials were pretty organized to begin with.... but I need to label, label, label for my kiddos! F.Y.I... 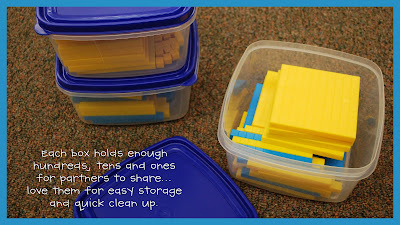 This really isn't the best time to share this however... the OrgAniZatIoN thing reminded me about this boxes that saved my sanity with base ten blocks... I LOVE them! 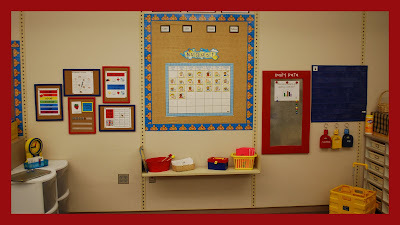 I bought them at Dollar Tree... they are about 8' square and fit enough base ten blocks for partners... in 2nd grade we use many hundreds and they take space... AND I got tired of ripped baggies ;) They stack up quick and easy and look nice! Great idea of using those containers. I too am tired of ripped baggies. About how many units, rods, and flats do you put in each container for a set of partners? Approximately, 25 units, 10 rods and 5-6 flats. We've found that if we put the flats in first the tens and ones easily fill in the extra space and the lid fits nicely! Great storage idea! Thank you!!!! The most sought after social networking site Twitter assists folks to learn about current matters and pursuits or social reactions of their favored stars.